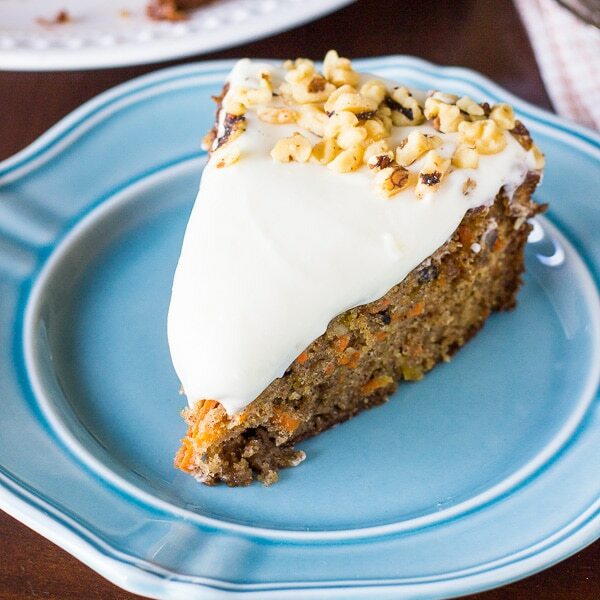 One of my favorite things about Easter brunch is having a slice or two of this Homemade Carrot Cake. I honestly could skip the whole rest of the brunch and just eat this carrot cake and I would be happy! 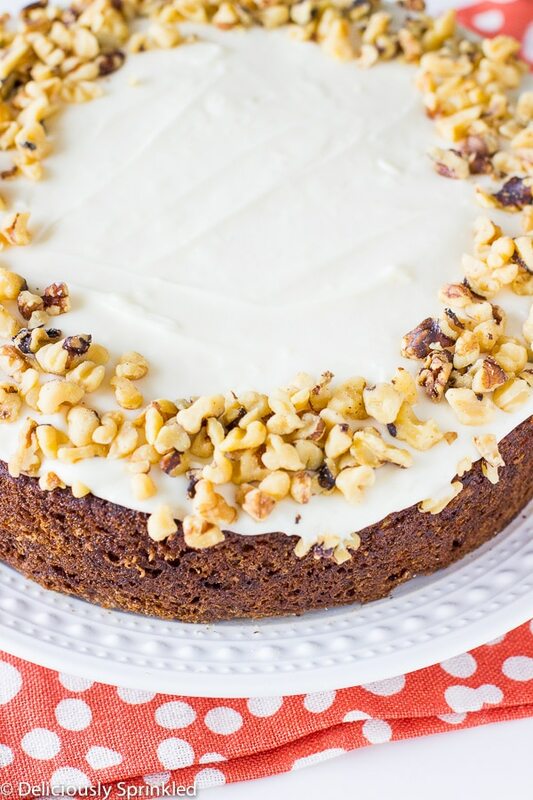 And with Easter right around the corner, I’m so excited to share my Homemade Carrot Cake recipe with all of you today, just in time for you to make this carrot cake for your families brunch. This Homemade Carrot Cake is full of flavor, super duper moist, and it’s actually super easy to make. If you have made my Carrot Cake Cupcakes, this is the same recipe just in a cake form. It’s topped with my favorite cream cheese frosting and to make this cake a little fancier for Easter, I SPRINKLED some chopped walnuts on top of the frosting. Isn’t it pretty!? 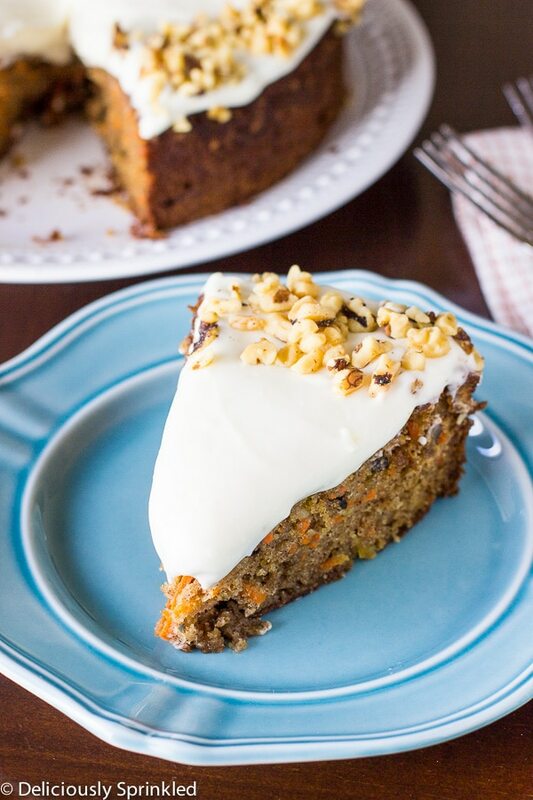 Seriously, if your still trying to deciding on what dessert your going to make for your Easter brunch…look no further because I promise this Homemade Carrot Cake will be a huge hit with your family! ✔ If you want to make a two-layered cake, all you need to do is pour the cake batter evenly into two 9 inch cake pans, rather than just one 9 inch cake pan that I used to make this recipe. To assemble the carrot cake once it has cooled, all you need to do is place 1 cake layer on your cake stand or serving plate. Evenly cover the top with frosting. Top with 2nd layer and spread remaining frosting all over the top and sides. Decorate the top of the cake with the remaining chopped walnuts. ✔ I like to use chopped walnuts in my carrot cake rather than pecans but you can use pecans or both if you would like. ✔ For the cream cheese frosting, I highly recommend using heavy whipping cream because it gives this frosting it’s creamy, smooth texture. If you don’t have heavy whipping cream, you can use milk but just know that the frosting wont be as creamy but still delicious. PRE-STEP: Preheat oven to 350F degrees. Spray 9 inch cake pan with nonstick cooking spray. Set aside. STEP 1: Using an electric or stand mixer, mix the eggs, canola oil, crushed pineapple, brown sugar, and sugar until smooth. STEP 2: In a medium bowl, whisk together flour, baking soda, baking powder, salt, nutmeg, and cinnamon until combined. STEP 3: Slowly mix in dry ingredients to the wet ingredients until no clumps remain. DO NOT OVERMIX! STEP 4: Stir in vanilla extract, carrots, and chopped walnuts. STEP 5: Pour the batter into the cake pan. Bake for 40-45 minutes or until a toothpick inserted into the centers comes out clean. Allow the cake to cool completely in the pan set on a wire rack. STEP 6: Beat softened butter and cream cheese on medium speed with an electric or stand mixer. Beat for 3 minutes until smooth and creamy. STEP 7: Add powdered sugar, heavy cream, salt and vanilla extract, increase to high speed and beat for 3 minutes. STEP 8: Frost cooled cake and top with chopped walnuts. * Store cake covered at room temperature or in the refrigerator for up to 4 days. Want to make cupcakes! ?--> click here for my Carrot Cake Cupcake recipe! Do I add the pineapple without the juice? Thanks! Carrot cake is a must for Easter at our house! Yours looks perfect!